Keep your unused floor coverings organized and easy to manage. 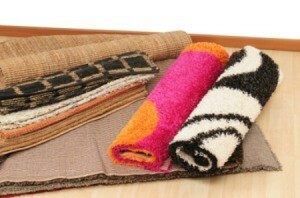 This guide is about storing area rugs. Save old belts to use when storing or moving large area rugs. Roll up the rug and wrap a couple of belts around it, using the belt buckles to secure the belt in place. The belts are great for preventing the rug from unrolling and also work as handles for moving the rug. Nylons work well too. I use them to tie up alot of things, as hoses, stacks of garden fence, rugs, etc. just the tip I need as we are moving in the next month! What a fantastic idea! Thanks, I will have to try this one- it is a keeper of an idea that is for sure! The only problem with the belts is that once you use them; you can NOT roll the rolled carpet without fear of scratching and knicking the floor. You will have to carry the rug. We use old bits of rope so we can roll the carpets easily. It makes use of smaller rope pieces and prevents any type of mold from forming if you're in a wet climate and happen to use leather belts. To protect our hands we use gloves when lifting or you can tuck in some small handtowels (we use them for cleaning) and thus have removable and flexible handles when needed. We donate old belts to charity if we no longer wear them.